Penn Engineering recruits exceptional students from all socioeconomic backgrounds and from all across the globe. A named scholarship or fellowship, endowed in perpetuity, underwrites tuition costs for aspiring engineers and increases access to Penn Engineering’s world-class education. They also ensure the School remains an institution of choice for the world’s most talented and ambitious students. Gifts are payable over five years. Endowed scholarships and fellowships may be established under a specific name, in honor/memory of someone else, or anonymously. Penn Engineering also appreciates and accepts gifts at any level to undergraduate financial aid through the Engineering Undergraduate Scholarship Fund. Individual contributions are pooled with the donations of other generous donors. Named scholarship donors experience firsthand the joy of bringing a Penn education within the reach of any qualified student who has the talent and ambition to succeed here. To encourage support for Dr. Amy Gutmann’s Penn Compact 2020 priority of Inclusion, challenge funds may be available to match various scholarship gift levels. $2 Million creates a Men and Women of Pennsylvania Scholarship or challenge fund. Your gift of $1.5 million may be matched with up to $500,000 in challenge funds. $1 Million creates a scholarship supporting one high-need student each year in perpetuity. Your gift of $850,000 may be matched with up to $150,000 in challenge funds. $500,000 creates a scholarship meeting the average grant need of one student each year in perpetuity. Your gift of $400,000 may be matched with up to $100,000 in challenge funds. $300,000 creates a scholarship providing more than half of the average grant need of one student each year in perpetuity. Your gift of $250,000 may be matched with up to $50,000 in challenge funds. $75,000 creates a Young Alumni Scholarship; this option is open to donors up to 10 years after their graduation date. Your gift of $75,000 may be matched with up to $75,000 in challenge funds to create a scholarship supporting one student each year in perpetuity. Gifts at any level are welcome. 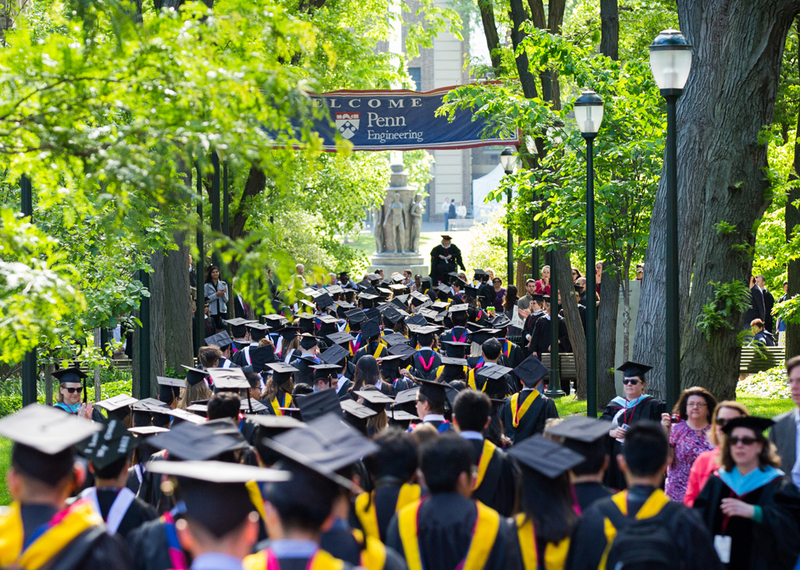 Your support will benefit undergraduate financial aid at Penn Engineering and increase access to the School’s elite education to any promising and qualified student with the drive to succeed here. Contributions are pooled with other generous donors and fund tuition for one undergraduate student each academic year. The scholarship is awarded annually to an engineering student of any major. The excitement and discovery of research is open to all students and is the keystone of Penn Engineering’s world-class Master’s and Ph.D. programs. Our graduate students are the vital link to the intellectual life of the university, serving as teachers, mentors, advisors, and collaborators. They also represent the future of scholarship. Those who advance to a career in academics reinforce Penn Engineering’s reputation among its peers. $1.5 million creates and names an endowed fellowship and provides full support for one graduate student for one academic year. $250,000 is the minimum gift amount to create and name an endowed fellowship and partially support one graduate student for a full academic year. Get on track with the enthusiastic members of Penn’s Transportation Systems Engineering Alumni Club (TSEAC), who need your help to fund this scholarship in honor of Dr. Vukan Vuchic. Dr. Vuchic has been instrumental in the professional development of many of his students, and the scholarship will help support an undergraduate student studying transportation engineering or a field related to Dr. Vuchic’s work.